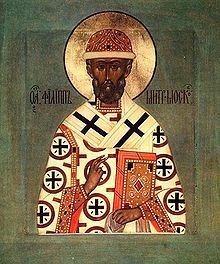 Vested as a hierarch with omophorion, holding a Gospel Book, with his right hand raised in blessing. Iconographically, he is depicted with a medium sized dark beard with flecks of grey. Saint Philip II of Moscow (11 February 1507 – 23 December 1569) was a Russian Orthodox monk, who became Metropolitan of Moscow during the reign of Ivan the Terrible. He was one of a few Metropolitans who dared openly to contradict royal authority, and it is widely believed that the Tsar had him murdered on that account. He is venerated as a saint and martyr in the Eastern Orthodox Church. He was born Feodor Stepanovich Kolychev into one of the noblest boyar families of Muscovy, in the city of Galich (in present-day Kostroma Oblast). However, according to some sources, he was born in Moscow. Grand Prince Vasili III took young Theodore into the royal court. It is said that since childhood Theodore was on friendly terms with Ivan IV of Russia ("Ivan the Terrible"). According to other accounts, he was involved in the conspiracy of Prince Andrey of Staritsa against Elena Glinskaya and, when their plans were discovered, he escaped to Solovetsky Monastery on the White Sea. Yet another account says that his decision to become a monk occurred on Sunday, June 5, 1537, while he was standing in church for the Divine Liturgy, on hearing the words of Jesus: "No man can serve two masters" (Matthew 6:24). According to this account, he secretly left Moscow dressed as a muzhik (peasant), and for a while he hid himself away from the world in the village of Khizna, near Lake Onega, earning his livelihood as a shepherd, later joining the monastery at Solovetsk. At any rate, he entered the monastery at Solovki at the age of 30, and a year and a half later he was tonsured (took monastic vows), receiving the religious name of Philip. In the monastery he worked at the iron forge and as a baker. 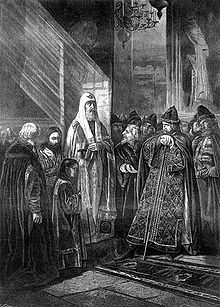 Metropolitan Philip confronting Ivan the Terrible (drawing by Vasili Pukirev, 1875). Eleven years later, Philip was made hegumen (abbot) of the monastery. During his term in office, they constructed two cathedrals, a brick-yard, many water-mills and storehouses, and a network of canals connecting 72 lakes. It is said that Philip took part in all these toils together with other monks. As a result, the monastery experienced a spiritual revival. He also adopted a new monastic Rule (Typicon) for the community. Most of Philip's projects in Solovki survive to this day. The tsar heard about the indefatigable monk and asked him to fill the vacant metropolitan see of Moscow. Philip agreed on condition that Ivan would abolish Oprichnina. On June 25, 1566 Philip was consecrated a bishop and enthroned as Metropolitan of Moscow and all Russia. Malyuta Skuratov approaching Metropolitan Philip in order to kill him (painting by Nikolai Nevrev, 1898). After only two years, however, Ivan the Terrible persisted with committing murders under the aegis of Oprichnina. During Great Lent, on the Sunday of the Veneration of the Cross, March 2, 1568, when the Tsar came to the cathedral for Divine Liturgy, Philip refused to bless him and publicly rebuked him for the ongoing massacre. The Massacre of Novgorod ensued, and Philip's condemnation followed. Ivan eventually deposed Philip from office by raising incredible charges of sorcery and dissolute living. Philip was arrested during Liturgy at the Cathedral of Dormition and imprisoned in a dingy cell of the Theophany (Bogoiavlenskii) Monastery, fettered with chains, with a heavy collar around his neck, and was deprived of food for a few days in succession. Then he was transferred and immured at the Monastery of the Fathers (Otroch Monastery) at Tver. In November 1568, the tsar summoned the Holy Synod, which had Philip deposed. A year later, on December 23, 1569, he was strangled by the Tsar's minion, Malyuta Skuratov at Otroch, two days before Christmas. As if aware of his approaching death, Philip had asked to receive Holy Communion three days earlier. After his martyrdom, monks from Solovki Monastery asked for permission to transfer the body of St. Philip to their monastery. When they opened up the tomb they found the body of the hierarch was incorrupt, and various healings began to be reported. The transfer of his remains from Tver to the Solovki Monastery took place in 1590. His main feast day falls on January 9 (for those churches which follow the traditional Julian Calendar, January 9 falls on January 22 of the modern Gregorian Calendar). The feast of the translation of his relics is celebrated on July 3 (July 16). On October 5 (October 18) he is celebrated as one of the Hierarchs of Moscow. The celebration of a special day (Synaxis) to honor Saints Peter, Alexis, and Jonah as "Metropolitans and Wonderworkers of All Russia" was established by Patriarch Job in 1596. In 1875, St. Innocent, Metropolitan of Moscow proposed that St. Philip be included with the others. Tsar, a 2009 Russian drama film directed by Pavel Lungin. This page is based on the Wikipedia article Philip II, Metropolitan of Moscow; it is used under the Creative Commons Attribution-ShareAlike 3.0 Unported License (CC-BY-SA). You may redistribute it, verbatim or modified, providing that you comply with the terms of the CC-BY-SA.